Based in Birmingham, Alabama, Hoar Construction delivers construction services to clients in a number of sectors, including healthcare, government, and mixed-use. With today’s leading-edge healthcare facilities so reliant on technology and connectivity behind every wall and ceiling, few project types present more complexities than those for the healthcare industry. 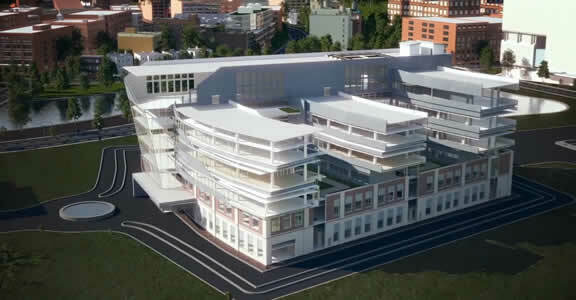 The new 785,000-square-foot facility expansion of the Benjamin Russell Hospital for Children campus typifies this complexity. The facility, with 12 patient floors plus equipment floors and rooftop heliport, will house state-of- the-art medical technology, all in an environment designed to reflect the playfulness of the precious young people it will serve. A longtime user of Autodesk Building Information Modeling (BIM) solutions, which enable users to explore projects digitally before they are built, Hoar Construction recently enhanced its capabilities by adding Building Design Suite Ultimate Edition to its workflow. The Building Design Suite helped the team manage the complexities of the Children’s of Alabama expansion. How? By making it easier to collaborate with the entire project team. 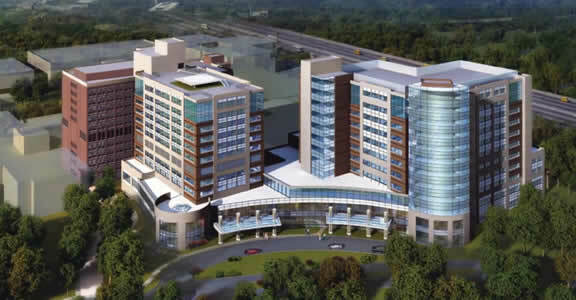 The hospital’s parent organization, Children’s of Alabama, engaged Hoar Construction, in a joint venture with KBR Building Group, to help guide the project before design began on the hospital expansion. Leaders at the hospital understood the complexity of the project, and they wanted Hoar Construction to provide a contractor’s perspective on design decisions as they were made. The ultimate goal of this early involvement was smoother execution of construction in the field. Just as importantly, the hospital wanted to ensure the project was completed on time and on budget. After choosing Hoar Construction to provide input on the design, Children’s of Alabama engaged the architectural joint venture of HKS and Giattina Aycock Architecture Studio to design the expansion facility. A key donor to the project specified that the building’s design should reflect the fact that it serves children. Featuring a curving façade punctuated with bright colors, the hospital’s exterior and interior have a lively, playful feel. As the architects created a model of the building in Revit Architecture software, part of Autodesk Building Design Suite Ultimate, Hoar Construction explored the model for constructability within the same application. The implications of the building’s curves attracted the Hoar Construction team’s attention. Concerned about allowing enough space for the complex building systems required by hospitals, the team believed that the soffits specified in the design took up too much space. Prior to beginning construction, Hoar Construction invited the subcontractors on the project to participate in the BIM process. During construction, the firm established a room for the subcontractors’ designers to come together and work simultaneously on models of their portions of the project. Working on a shared server, the team used multiple Building Design Suite Ultimate applications side-by-side to help coordinate their systems. 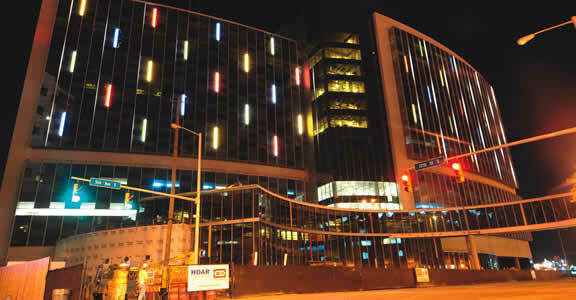 The curving façade of the hospital expansion is clad on all sides in glass curtain wall with an intricate pattern of various transparencies, colored panels, and accent lighting. To accelerate installation, Hoar Construction worked with the curtain wall subcontractor, Physical Securities, to prefabricate the façade off-site in a nearby warehouse, generating two-story sections that arrived at the site preassembled and were installed in minutes. Working from the Revit model helped allow for increased precision in the prefabrication process, and the team was amazed by how perfectly the curtain wall snapped into place. 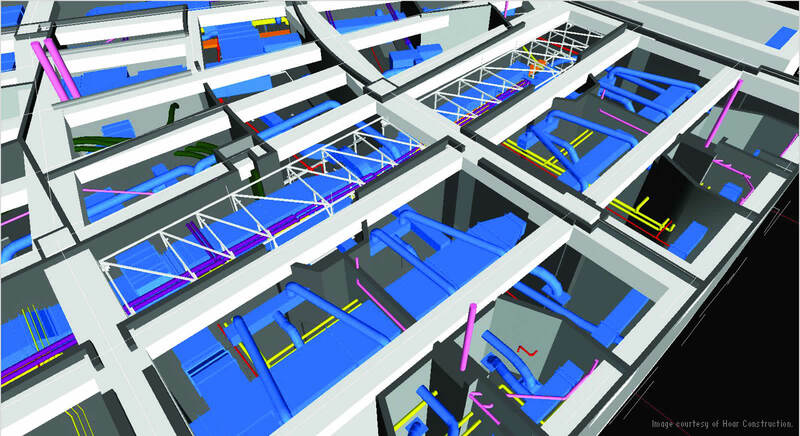 Gilbane uses BIM to improve quality, shorten schedules, and improve team coordinationin the field. 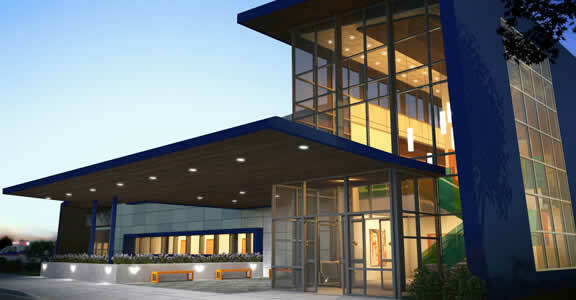 The firm also uses BIM for building maintenance and operations. 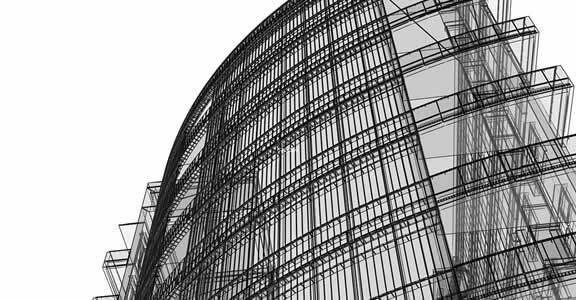 BIM construction can help firms build with greater efficiency, and enhance quality andprofitability. BIM helps the firm speed completion of the project through improved coordination, reduced waste, and better collaboration with the design team.